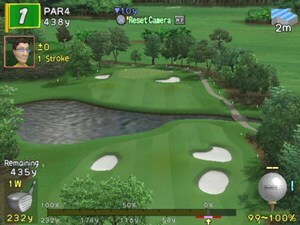 Playing a round of Golf at home on your computer or with your Game Console (Play Station 2, XBox, Game Cube) is great fun. Today's Golf Computer Games are very realistic, graphics and game play are amazing. Golf beginners can even learn the Golf basics and the rules. Feel like Tiger Woods, Davis Love III or Charles Howell III. This is my favorite Video Golf game. The graphic is brilliant and the game play is very smart. You will have a lot of fun playing it alone against computer competitors or against other players around the world via the web. The analog stick is used to hit the ball with kind of a real swing. You can control the power and direction of your shot with a back and forward motion on the analog stick. A nice feature: You can add power by pressing the L1 button during a backswing or add spin in the air by tapping L2 while the ball is in the air. Tiger Woods PGA Tour 2004 offers 19 different courses to play, 14 of them are playable without unlocking. Seven new courses have been added such as the challenging Bethpage Black and Pinehurst No. 2 courses to go along with old favorites like Pebble Beach and St Andrews. 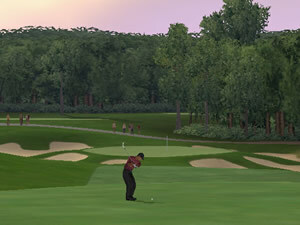 The increased number of courses compared to Tiger Woods 2003 makes the new version a worthwile purchase. You can play as or against over a dozen top PGA Pros, including Tiger Woods, Vijay Singh, Justin Leonard, and new golfers like John Daly and Adam Scott. The Expanded Career Mode lets you take your golfer through a 52-week World Tour to earn money and sponsorships. The earned money can be invested to buy new Golf Clubs, Shafts, Balls and much more. Best Video and PC Golf Game. Rent Video Games Online! Start your Free Trial with GameFly now! This is a real fun game and an attraction for every party. It's more an Arcade Game than a Golf simulation. Golf is presented in a fresh way and the Game is great for people who weren't familiar with Golf so far. You play Goofy Golf with cartoon Golfers. You use a little sliding horizontal hit meter to smash the ball and a grid to help with putting. Nothing new in terms of general design. The gameplay is very easy to learn: You press a button three times to use the little horizontal hit meter. Spin can be added to the ball depending on the golfer's spin skills. There are three type of Game modes: Classic Stroke play lets you take on a course alone and gain points. In the Tournament mode you play against different Computer golfers. The better you play the more your player climbs the rankings and unlocks new courses. There are six courses available but four of them need to be unlocked. In VS mode you play against a Computer controlled Golfer. If you beat him that Golfer is unlocked. Fun Golf Game with easy Game Play and Control. Great for a round with your kids. Play a round of Golf on the Web with this amazing free online Golf Game from Nabiscoworld.com. It's the best free Golf Game on the net I've found so far. It's similar to the classic Links Golf Game. You can select a Golf Club then aim to the target and control the power with your mouse. Tip: Rent Video Games Online! Start your Free Trial with GameFly now!